When Do Hindus Worship Ganesha? A multi-armed, dancing Ganesh balancing on a rat is considered to be extremely auspicious. One of the most beloved and popular gods in the Hindu pantheon has the head of an elephant and rides on a rat. Ganesh, also called Ganesha or Ganapati, is the focus of huge late-summer celebrations in Mumbai, Pune, New Delhi, Tamil Nadu, and other cities and regions of India. But Ganesh is as much a domestic as a civic deity and is a personable object of daily worship. Parvati, the consort of Lord Shiva, was disconsolate at his long absence so she gave birth to a son, Ganesh, who became her constant companion. When at last Shiva returned home, Ganesh refused to allow him in and as neither recognized the other, Shiva lost his temper and cut off Ganesh's head. To placate Parvati, who was understandably upset, Shiva rushed out and lopped off the first living head he encountered, and placed it on Ganesh's body. One headless elephant and one elephant-headed god later, Ganesh quickly became a favorite of devout Hindus and is today the first god invoked in any religious ceremony. "Om Ganesha Namaha" means "I bow to thee, Lord Ganesh" and is chanted at the beginning of private and public Hindu rituals. If every Hindu home in India doesn't have its Ganesh altar, it's likely that most do, and they are well-tended. 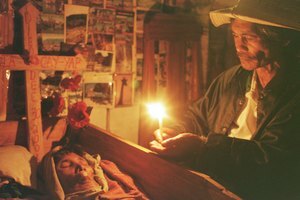 Daily worship is important; no day should go by without offerings, bowing and praying to the benevolent god. But the affection for the odd, pudgy deity can be publicly gauged at the annual Ganesha -- or Ganapati -- Chaturthi festivals that take place in India over ten or 11 days between August and September. Chaturthi celebrates the god's birthday and thousands of followers turn out in cities across India for ritual washing and dressing of large Ganesh statues, offerings of sweet prasad, marathon mantra chanting, traditional music and a procession to the sea or river. The giant Ganeshes that have been publicly worshiped are immersed in the water on the final day of the festival -- devotees wade right in to see them off. The immersion honors Hindu belief that a statue can be enlivened to become the living god and must be disposed of respectfully. His round belly, chubby legs, multiple arms, missing parts and that memorable head don't keep Ganesh from his role as divine heartthrob. He is loved and importuned at every puja for his ability to bestow good fortune and remove obstacles. The elephant head is very useful. The trunk symbolizes the tremendous strength and wisdom of a righteous person. Large elephant ears admit all knowledge. The unusual juxtaposition of elephant and human body directs the attention to the intrinsic divine nature of everything, despite outward appearances and illusions. 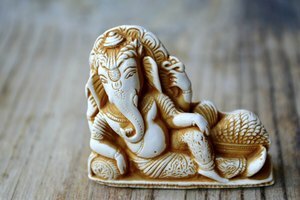 A missing tusk signifies that Ganesh broke off his own tusk to wrote down the Mahabharata, India's great spiritual epic. His many arms and hands hold symbolic items: a lotus for enlightenment; a hatchet to remove bad karma; confections to reward a wise life; a mudra, the sacred shape of the hand into a blessing. Ganesh's less-than-svelte mid-section reminds followers that life is abundant. A rat underfoot stands for mastery of the undisciplined senses. Ganesh is endlessly adaptable. Under restrictive British rule, Ganapati Chaturthi festivals were one way for Indians to gather in public and express solidarity. The festival celebrations retain some political flavor today -- in India, the site of communal worship may also contain booths representing different political factions -- but the powerful and approachable god remains the focus of attention. Worldwide, Hindu temples stage parties for Ganesh's birthday and a new generation is factoring eco-conscious concerns into preparations for traditional rituals. 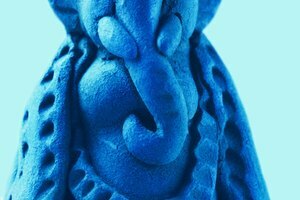 Instead of commissioning mammoth fiberglass or plaster Ganesh statues brightly painted in acrylics for the festival, organizers in New Delhi switched to clay statues with natural dyes that will biodegrade in the water. The scores of old statues are an environmental hazard; the new ones represent the spiritual ideas of creation and dissolution. 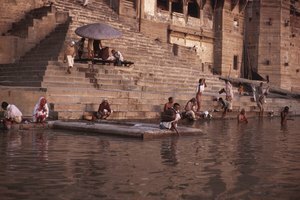 After immersion, they will gradually disappear without a trace. Crawford, Benna. "Hindu Rituals & Ganesh." 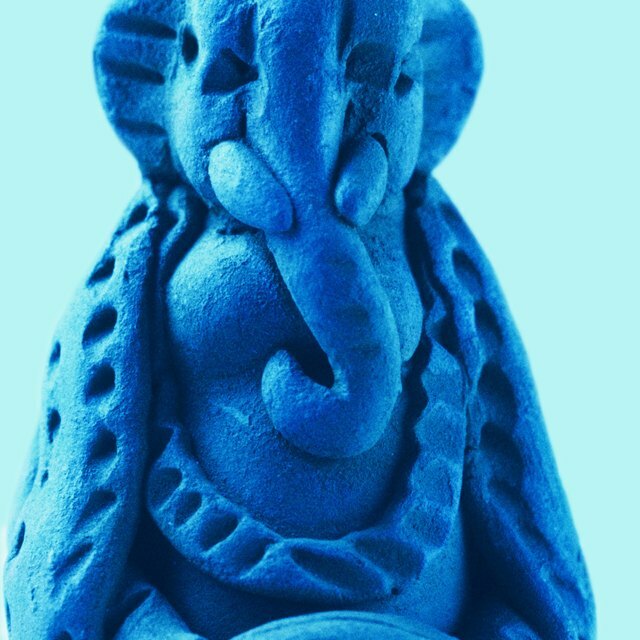 Synonym, https://classroom.synonym.com/hindu-rituals-ganesh-12086357.html. 29 September 2017.